Lil Loopy Beanie is now available for purchase! It was tested by 11 folks on the Free Pattern Testers forum on Ravelry. As you can see, this pattern is super fun to the eye. It is also extra cozy because the loops create an extra layer of warmth. 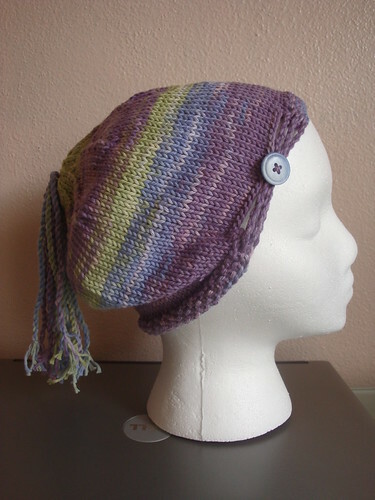 The beanie pictured above was done in a self striping yarn; however, testers had nice results with variegated yarns as well as rows of solid colors. 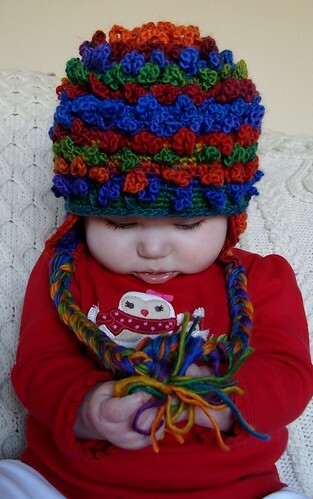 The pattern also includes optional earflaps to keep out the winter chill. Last on the page is the tutorial on how to make the braids. 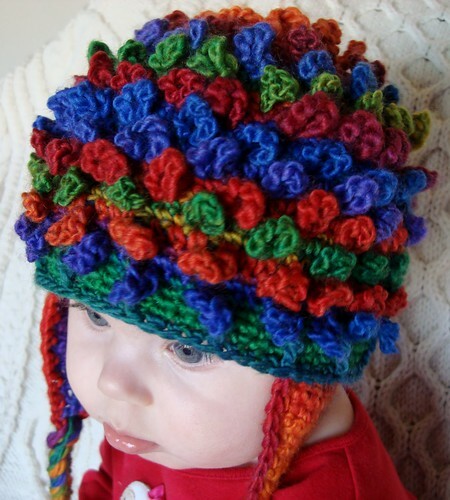 Difficulty: The pattern uses only beginner level stitches. 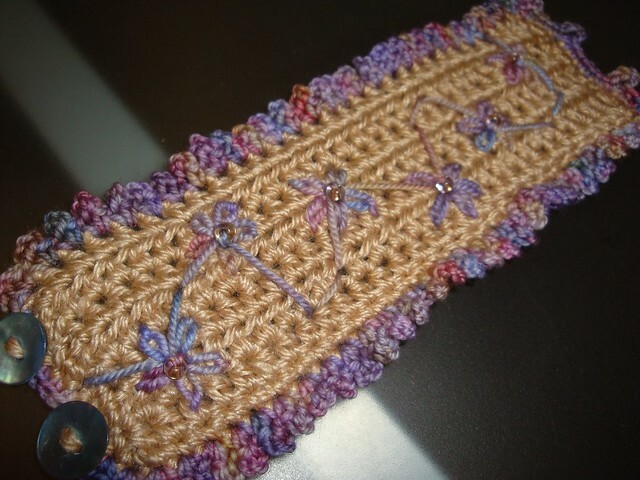 The main section uses single crochet and the chain stitch and the brim uses single crochet and double crochet. There is a picture and video tutorial to help with the loop placement. This pattern would be good for an advanced beginner. Sizing: Many testers reported it was hard to keep gauge and thus I recommend going down a size if you are on the edge when choosing a size. Please let me know if you have any feedback! If you happen to sell something using this pattern, please put a link to my blog. “Like” K1 Sew Too and message me for a 50% off coupon code! 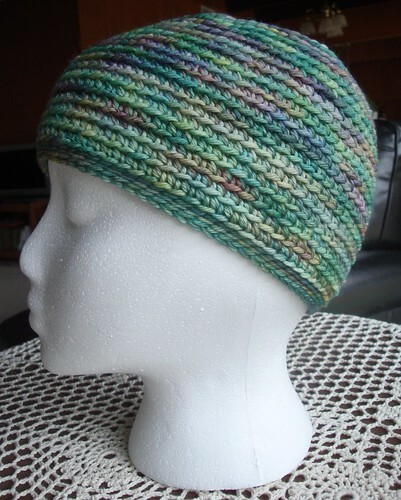 I have had many requests for a brim I created for several of my crochet hats. Well, who am I to keep such a fun brim from you all? That’s all there is to it! If you want a deeper brim do three rows of sc and then use a fptc instead of a double. This brim is especially fun if you work the two rows of sc in one color and the third row with the fpdc in a contrasting color. Enjoy! From here on out you will be working in the back loop only. Also, you will be working in continuous rounds. DO NOT join. Feel free to use a stitch marker for easier counting. Click here for the adult size instructions. At this point you do not need to mark the beginning of the rounds; continue to sc in the blo for approximately 2 3/4″ (3 1/4″, 3 1/2″, 4″, 4 1/4″). This measurement is from the outer edge of the crown. Once you have reached the measurment listed above you will start the brim of the hat. Continue in the round with a ss in the blo for approximately half an inch. Make sure you do not slip stitch tightly. 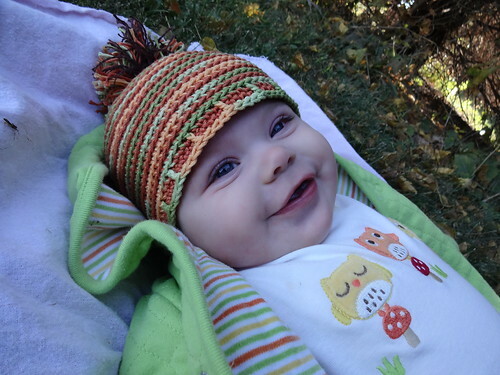 (You don’t want the hat to be too tight on baby’s head!) It may help to go up a hook size or two. Fasten off and weave in the ends! Note: Please let me know if you have any feedback! Also, this pattern may be used for whatever purpose you would like to use it. If you happen to sell something using this pattern, please put a link to my blog. My first reason for loving the month may sound a little selfish, but I can’t hide the truth. I was born on September 5th and have always loved my birthday. Now that I am older I try to stretch it to include the entire week. And, in certain years (this year!) my birthday is even a National holiday. A free day off work – it doesn’t get any better than that! I also share my week of birth with one of my very best friends, Ms. Carrie. She was born on September 6th so we invite our friends over, cook some tasty food, and exchange gifts. Of course there’s always an abundance of family time around holidays/birthdays that I also enjoy. I have always liked learning and thus school. Summer rolls into the Iowa State fair and then straight into September and the new school year. I saw new classes as opportunities to start over, learn, and do better. I’m a smart girl, but I’m a slow kind of smart. I’m the kind that has to re-read her notes one hundred and one times to remember it. So… every year was that opportunity to try for all A’s. A new school year also meant new experiences with friends… and let’s not forget the back-to-school shopping! Ah, what else is there to love, you ask? The weather! There are occasional sweltering hot days and some overly cool days, but overall the weather is wonderful with just a hint of chill to shoo us into fall. The change in weather also means I get to pull out my winter clothes. I always find old friends (still talking about clothing here) packed away in a tub. 🙂 The change of clothing is especially nice since I started knitting and crocheting. Yarning is a cool weather sport and thus the yarn shops are busier and have overflowing baskets and shelves of yarn. 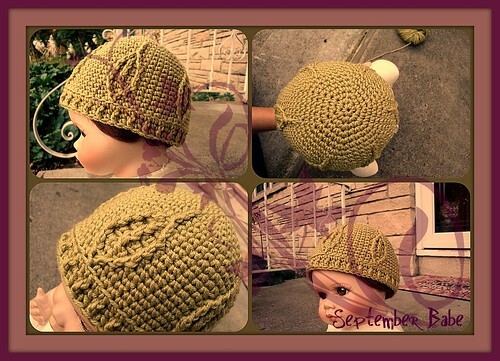 So since I have such a love for September I decided to make a crochet hat dedicated to the month. I currently have only a newborn size hat created, but it’ll give you a peak of what’s to come. 🙂 I plan to have sizes preemie to small adult available soon! Gauge is not particularly important for this pattern as you can add chains to make the necklace or bracelet fit any neck or wrist size. 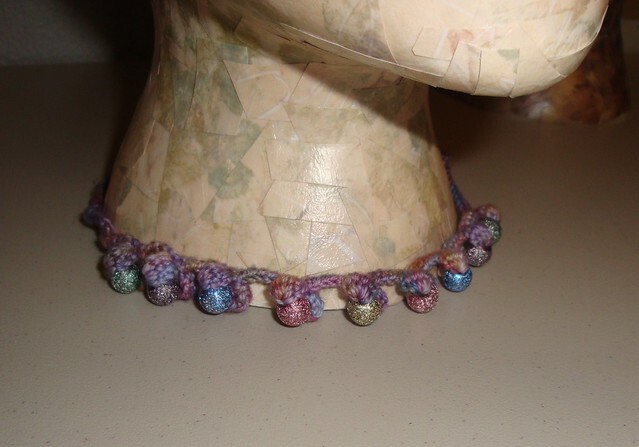 Before beginning this piece you will need to string beads of choice onto your yarn. ^Here is where you will add or subtract chains to increase or decrease the size of the necklace or bracelet. 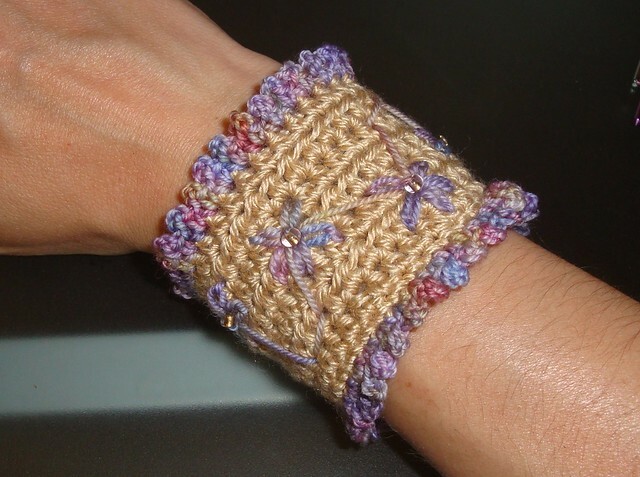 This cute crochet cuff is simple and sweet. It was based off the knit version by Champagne Maker; her version is called My Secret Life With Bees. 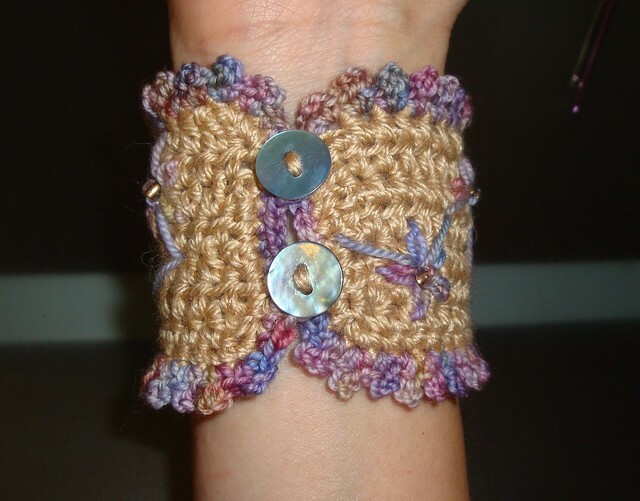 This pattern is easy to alter to fit any wrist size. (More pictures at the bottom of the post.) You will find more of my patterns here on Ravelry.com. Gauge is not particularly important for this pattern as you can add rows to make the cuff taller and you can add chains to the initial chain to make the cuff fit any wrist size. At this point you will attach color B along the bottom left corner of the cuff and follow the pattern below around the edges of the cuff. You will now be using the 2.75 mm hook as well. Now it is time to embroider your cuff. You may embroider whatever you’d like, but I used the lazy daisy stitch to create the daisies on my cuff. You will find a video here. The woman is use fabric and embroidery floss, but it is the same technique. Next I attached two buttons on the sc side of the cuff. They should like up with the ch 4 on the other side of the cuff. Last, I sewed fabric on the back side of the cuff for structure. It isn’t necessary, but it is fun to pick out fabric and good sewing practice! At this point you do not need to mark the beginning of the rounds; continue to sc in the blo for approximately 4″ (4.25″). 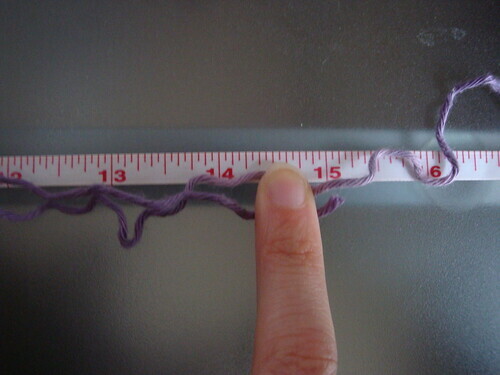 This measurement is from the outer edge of the crown. Once you have reached the measurement listed above you will start the brim of the hat. Continue in the round with a ss in the blo for approximately an inch. Make sure you do not slip stitch tightly. It may help to go up a hook size or two. Fasten off and weave in the ends! 5 sts x 8 rows = 1 in. x 1 in. Repeat rows 1 and 2 two more times to create three eyelets. Row 8: Join to work in the round and knit all stitches. Continue in stockinette until you are approximately 4.5-5 inches from the edge. Cut yarn leaving approximately 6 inches; use a tapestry needle to thread the tail through the remaining stitches a few times and fasten off. 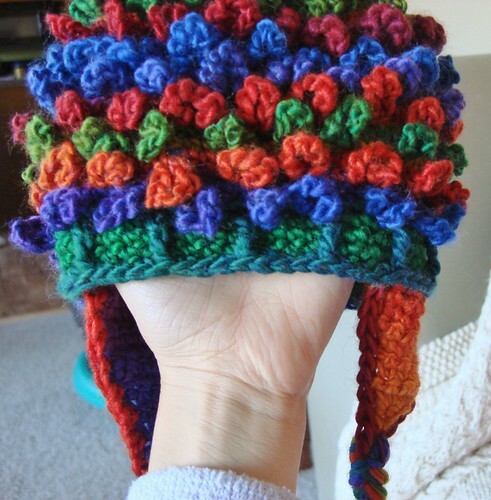 The last part of this hat are the twists (instructions below). 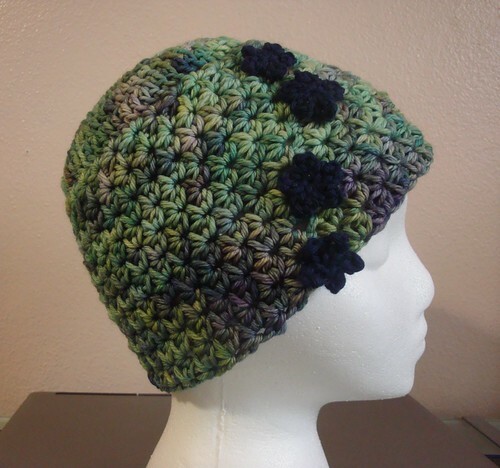 Three of the twists are put through the eyelets and then buttoned at the top of the hat. This creates the “bow” portion of the hat. The part of the twists that goes through the eyelets will then be sewn to the inside of the hat. 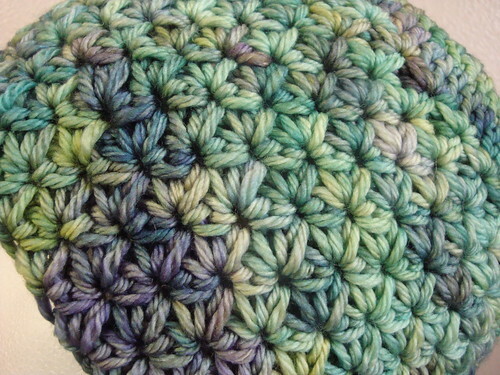 The twists will create a bump of sorts on the inside of the hat, but it is not noticeable from the outside. 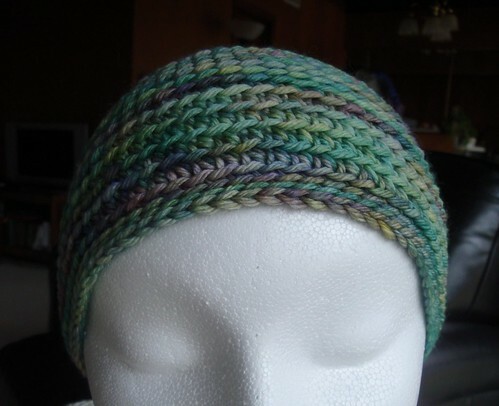 If you want to make the twists less intrusive I suggest a lighter weight yarn that matches your hat yarn. Another option is to use the yarn as a bow without twisting it. 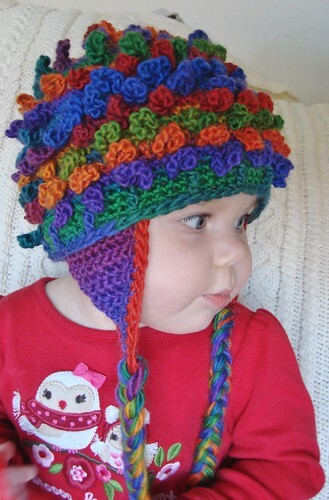 The rest of the twists are used for the top of the hat. (I used 18.) Thread a piece of scrap yarn through the “top” ends of each tassel using a tapestry needle. (The top end is the end without the knot.) 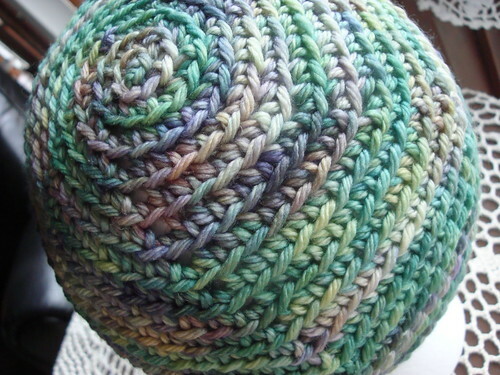 Then run the piece of yarn holding the twists together through the top of the hat to the inside. Weave in the ends and you’re done! 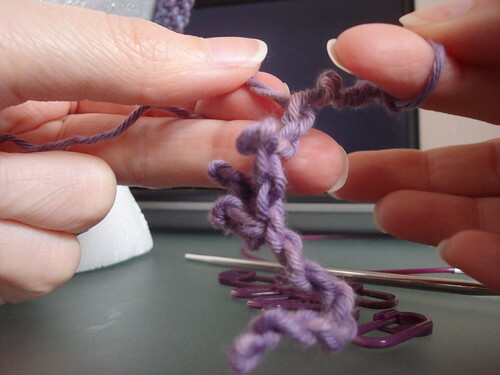 Second, place your finger at the end of the loop and use it two twist the yarn. 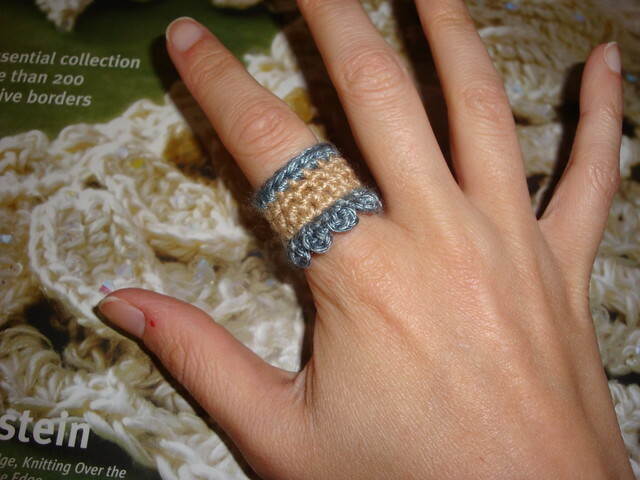 Twist until the yarn feels tight against your finger. 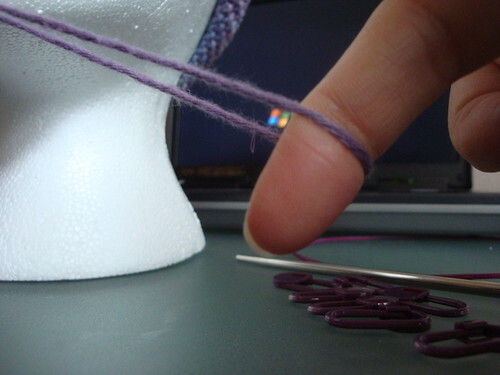 Third, bring your loop finger up to the other end of the yarn and hold them together. The yarn will twist up on itself as below. 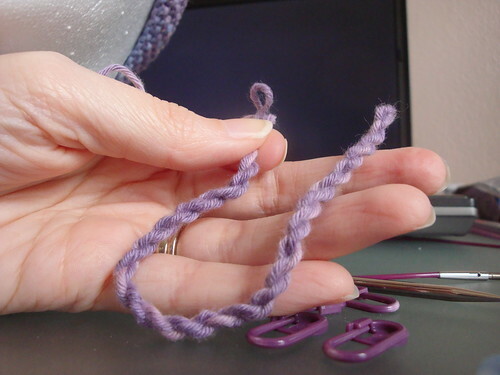 Last, while holding the yarn together in your left hand, use your right hand to sort of straighten the twist. Note: This is a relatively simple pattern; however, it has not been tested. Please let me know if you have any feedback! Also, this pattern may be used for whatever purpose you would like to use it. If you happen to sell something using this pattern, please put a link to my blog.